Winter Break will take place December 21st-January 1st. School will resume on Monday, January 4, 2016. Enjoy your time with your family! If you or your student need to catch up on work, the OLS and the High School platform will be available to you during the break. Please join the Chicago Virtual Charter School Administration Team for a monthly meeting to highlight information regarding the school and upcoming opportunities for students and parents. The meetings will be held during the first week of each month during the first half hour of your student’s Learning Center time (9 o’clock and 12:30). When we return from break (week of January 4th) we will hear from Ms. Fadia Afanah, CVCS High School Academic Administrator. Our 3-5th grade Joffrey dancers will share their hard work in a final performance on Friday, January 29th at 1pm in Gotlieb Hall. While the performance is short and sweet (one routine) – it will show off the steps they have been practicing and the fun they have been having. Dancers should report to the Parent Room at 12:30pm for a review before the performance. We at CVCS strive to ensure that we are creating the most conducive and safe learning environment for our students. To ensure our students are safe and that they are working to be the best student they can be, we have outlined some specific Learning Lab expectations we expect all of our awesome students and families to follow. We hope to make Learning Lab better than it ever has been! We believe that these expectations will help us reach that goal. • Electronic devices are put away. We will have basic calculators for students to use when needed, so there is absolutely no reason to have a cell phone out. • Lunch for those in the learning lab is from 11:45-12:15. If you leave learning lab for lunch and plan to return, you must be back in learning lab by 12:15. This is the only time students are allowed to leave to eat if here for learning lab. • Ask for permission to use the restroom. If learning lab is on the 2nd floor, you are to use the 2nd floor restrooms. If learning lab is on the 1st floor, you are to use the 1st floor restrooms. • You must sign in and sign out every time you enter/leave the learning lab after receiving permission to leave. • Sometimes there will be assigned seats in the learning lab. When this is the case, please sit where you are told to sit. • Headphones are to be used only for class connect and/or classroom lessons after being approved by the learning lab supervisor. Headphones should not be used for any other reason. • Students must be completing schoolwork or attending a class connect while in the learning lab. Students may receive a form to fill out regarding the work completed during their time in learning lab. • This is a quiet work zone. If you need something, raise your hand or quietly see the learning lab supervisor. The No Child Left behind Act (NCLB) of 2001 makes it clear that Congress expects that schools receiving federal funds must ensure that parents are actively involved and knowledgeable about their schools and their children’s education. The law requires schools to give parents information and notices in a uniform and understandable format and to the extent practicable, in a language that the parents can understand. The following are several key notifications that CVCS must provide to the parents of Title I served students. 2. Whether the teacher is teaching under emergency or conditional certification. 3. The baccalaureate degree major of the teacher and other graduate certification or degree, and the field of discipline of the certification and/or degree. Timely notice to parents must be sent if their child has been taught for four or more consecutive weeks by a teacher who is not highly qualified. Timely notice means that this notification must be provided to parents of students no later than the end of the fourth consecutive week. The notice and information provided to the parent must be in an understandable and uniform format and, to the extent practicable, provided in a language that the parents can understand. [Sec. 1111(h)(6)(B)(ii)]. Each year that CVCS receives Title I, Part A funds, the school must provide parents with an individual student report informing them of their child’s level of achievement on the State’s assessments in at least reading/language arts, and math. [Sec. 1111(h)(6)(B)(i)]. This requirement is covered by the states individual student assessment report. The first Box Tops/ Labels for Education contest is in progress. The class that collects the most Box Tops will win a pizza party! The winter break is a great time to look for and clip labels. Bring in your clipped Box Tops or Labels for Education to your teacher in a bag that is labeled with the teacher's name and grade. In order to give the correct class credit, it is important that the name of the teacher and grade is on the bag or envelope. If they are not labeled properly, they will be evenly distributed to all the classes. The deadline to submit the 1st round of Box Tops is Friday, January 29th. 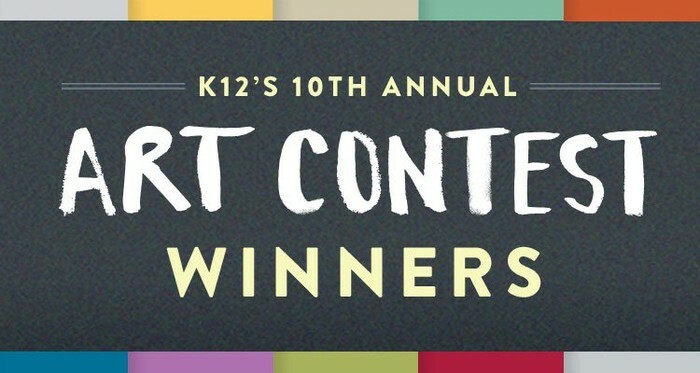 The 2015 K12 Art Contest winners have been announced, and there were two winners from Chicago Virtual Charter School. Kindergarten 3rd Place: Aaron F.
Future Decade Finalist: Syeda S.
To view all of the K12 Winners, please click the following link. E. Martin is a model student for positive behavior. She is a very respectful child and is always helpful to others. She puts a smile on your face whether you are a student or a teacher. She gives a hug to anyone who needs it and some days we all need it! E. Martin stays focused on completing her own individual tasks and has offered to help others in completing their tasks for the day. I am very honored to have E. Martin be a part of my class this year. She makes my day every Tuesday morning!